The Long Island Ducks, last year’s Atlantic League champions, have been busy signing high-profile former major league players over the past few days. Nine-time All-Star and 2004 American League MVP Vladimir Guerrero undoubtedly made the biggest splash when he signed on Thursday, but the Ducks followed that up by signing 2003 National League Rookie of the Year Dontrelle Willis on Friday. 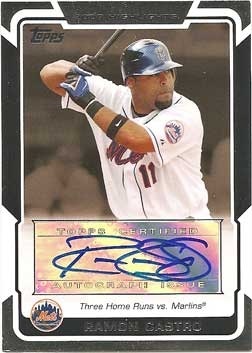 The Ducks’ latest addition is former major league catcher Ramon Castro, who played for the New York Mets from 2005 until 2009. New Jersey fans will have to wait awhile to see the Long Island Ducks – they make their first trip into the Garden State for a weekday series against the Camden Riversharks from May 20-23. They return to Camden for another weekday series from June 17-20 before making their first trip to Bridgewater to play the Somerset Patriots in a weekend series from June 28-30. I think the Long Island Ducks would be great on the MLB old-timers circuit… but I bet they do come close to outdrawing the Marlins or Astros at some point this season. Man the Atlantic League is going to be fun this year. Wish my Wingnuts could sign players that I have heard of. I could say the same thing about the Newark Bears.